Last week, ARM welcomed more than 200 members from 138 unique organizations from across the nation into Pittsburgh for our second annual Member Meeting. The three-day symposium featured distinguished speakers, collaborative working break-out sessions, ample networking activities, and provided attendees with easy access to ARM leadership and staff. Our event was open to members only, ensuring that activities and discussions remained focused and secure. 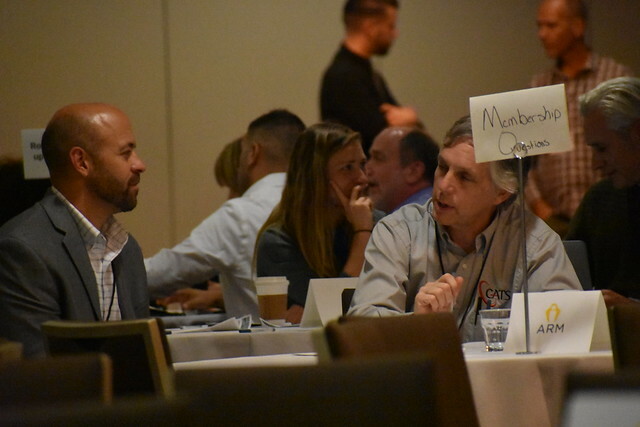 This annual event provides critical time for in-person project teaming across industries and membership levels, allowing attendees to make meaningful connections to form project teams. These connections are maintained using the digital ARM Member Community, which provides a place for closed collaboration and continued communication between members and teams. Members who were not able to attend can find digital content from the meeting, including the presentations, and a list of attendees, on the ARM Member Community. Members who were not able to attend can find meeting content, including the presentations and a list of attendees, on the ARM member community. Below are just a few of the highlights from our 2018 Meeting! ARM’s membership spans industry, academia, and government, bridging the gap to bring the best innovations in robotics and education/workforce development to market. Our annual Member Meeting brings these experts together for three days of intense discussion and activity all centering on the singular purpose of accelerating the advancement of manufacturing in the US. The dedication to ARM’s mission is unifying; at the meeting competitors can be seen sitting side-by-side collaboratively working to address complex issues affecting the national manufacturing ecosystem. The attendees for each member are experts in their field and decision-makers within their respective organization, keeping the focus of the event and discussions on innovation. Taking place on the final day of our meeting, our education/workforce development (EWD) break-out session featured deep dives into the state of the industry and our open project call that closes on November 30, 2018. Our first EWD speaker was Ron Painter, CEO of the National Association of Workforce Boards (NAWB). NAWB is a critical voice for 550 Workforce Investment Boards located in communities, large and small, throughout the United States. Mr. Painter outlined how government activities influence workforce development and how critical workforce development is for the success of the US. Next up, Dr. Mark Johnson, Ph.D., Director of the Clemson University Center for Advanced Manufacturing, addressed our workforce group. Dr. Johnson formerly worked in the Department of Energy and focused on current and future trends in advanced manufacturing, noting that although there are many factors that show a robust and growing manufacturing base in the US, there are other metrics that show a declining picture unless we take drastic steps to address the workforce gap. Attendees heard from a number of our project teams on both the tech and the EWD side. Additionally, ARM facilitated time for face-to-face interaction with the project teams during a poster session following the project presentations. Presenters included project team members participating in our older Quick Start Projects and the projects selected from our first formal project call that was announced last fall and included technology and education/workforce focuses. Learn more about our projects here. “The ARM annual member meeting is an excellent forum to interact with manufacturers, robotics users, developers, and researchers.” – John Wen, Ph.D., Head, Industrial and Systems Engineering (ISE) at Rensselaer Polytechnic Institute and project team member. Our technology focused session divided attendees into smaller working groups and focused on soliciting feedback from members on our newly drafted Technology Investment Strategy. This document, available for review on the Member Community, was created with influence from our Technology Advisory Committee (TAC) and outlines where the ARM tech strategy started, how member input has evolved the strategic direction, and how this strategy will inform future project calls. During the working section, each tech group had the opportunity to directly interact with our new Chief Technology Officer, Deputy Director of Technology Development, our Program Managers, and various members of our TAC. “First and foremost, the meeting provided Yaskawa Motoman a tremendous networking opportunity with top advanced manufacturing technologists and educators representing government, Fortune 500 companies, academia, SMMs and tech startups. It’s clear we all can learn from each other, and having all that knowledge in one location is hard to beat! I also enjoyed seeing a maturation of the ARM staff, which has really come together to form a unified team. Lastly, it was clear to me that ARM management is laser-focused on the Institute’s original mission and dedicated to listening to its members to form a meaningful and sustainable organization.” – Roger D. Christian, Divisional Leader, New Business Development at Yaskawa America, Inc. In 2019, we’ll have even more to share. We anticipate that the new ARM Headquarters at Hazelwood Green will be complete and available for tours. We will also have several completed projects, as well as new projects underway. If you’re interested in attending next year’s meeting, we encourage you to become a member and get involved now to set the perfect foundation before the event. Stay tuned for 2019’s date and location!